The Common Room, located in Fishtown, is a workshop, event space and a gallery featuring fine art and functional handmade items by women and non-binary artists throughout the Greater Philadelphia Area. Founded by Chelsey Eiel, The Common Room opened in August of 2017. The space focuses on fostering inclusivity. “There’s a lot of different language around gender non-conforming identities and I knew when I opened, I wanted this space to celebrate women, but I also wanted to recognize that gender is so fluid and there are so many people who maybe identify on that spectrum outside of just “woman” or “man.” I wanted this space to be really inclusive and different from traditional spaces that only allowed artists from a certain tradition or style,” said Eiel, who opens the door to allow anyone who feels misrepresented or unrepresented. Along with being inclusive, Eiel’s mission is also to foster collaboration and allow artists to approach work from a different place, experience growth and see the worth in their work. “I am not a traditional gallery and I am not going to represent your work the way a traditional gallerist would because I have my own process and things move around here everyday. Everyday it looks different. I really create the space by my gut and intuition, by the story I want to tell and the way I think the stories of the artists intertwine,” said Eiel. 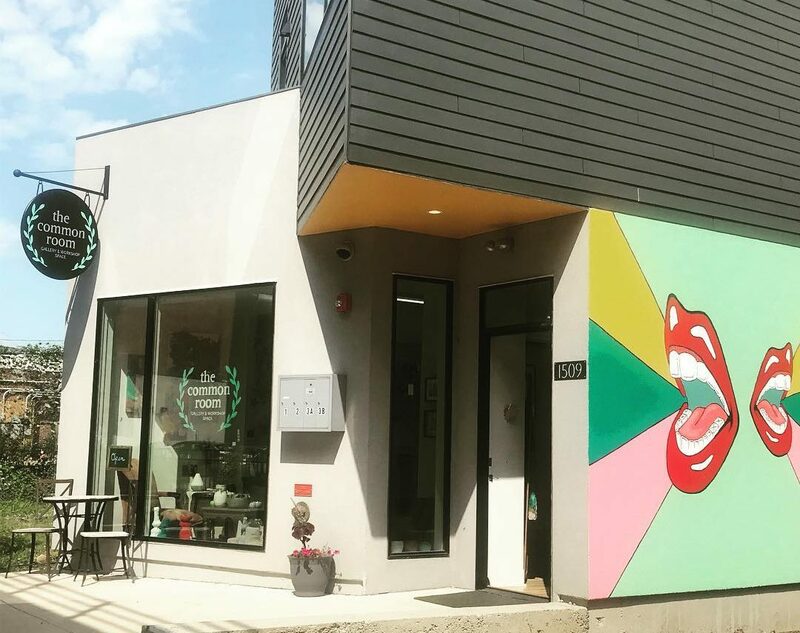 A part of the booming businesses along North Front Street, The Common Room is becoming a staple in the neighborhood as the main resource for emerging and professional artists and entrepreneurs. It is a hub for local women makers to showcase and merchandise handcrafted goods from fine art to jewelry, face masks, botanicals, ceramics, clothing, and paintings, in addition to hosting events. Eiel‘s background is in writing, sociology and psychology, and since the start of her career she has been an advocate for women voicing their stories. In 2015, Eiel brought women together by designing a writing workshop for college students to open up the dialogue around campus sexual assault. This was taught at the University of Pennsylvania and the Kelly Writers House. It was through this work and tuning into the students’ need for a space to continue sharing their voices and allow for a safe environment to represent themselves that the concept for The Common Room unfolded. Eiel was able to get a grant from the Women’s Opportunity Center, which covered the first and last month’s rent, along with the security deposit for the gallery’s current location. When she opened, Eiel had only 16 student artists’ work on view, since then she has worked with over 200 artists, and is actively featuring work by 95 femme-identified artists. What started with a space that would support her writing workshop and students has now become one that features work by women artists, hosts workshops and brings women together through different events. The Common Room is located at 1509 N. Front Street, Philadelphia, PA 19122.